We rarely encounter a single device that legitimately can be called a “solution on its own.” This was our exact sentiment when Stream Dudes first encountered the Switchblade Flyk. 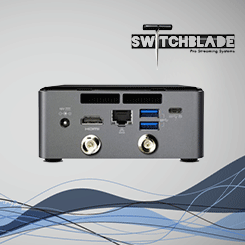 The first truly “mini” all-in-one broadcasting solution. 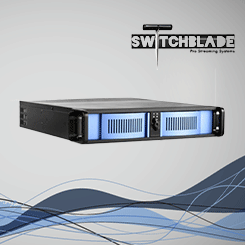 Built around the powerful vMix production software, the Switchblade Flyk and Splyce offer the ability to stream live video, playback video clips, record in a variety of formats, chroma key, overlay graphics and much more. Utilizing the input and output features of NDI, these powerful systems are perfect for any podcaster, or for any professional who needs affordability and portability in their broadcasts. Building a rackmount vMix Reference System can be a daunting task. 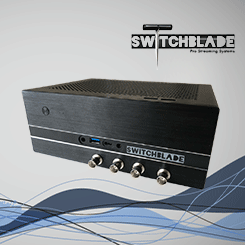 The skilled team at Switchblade Systems has done a great job building a solid system at a good price. These vMix-powered rack units are a great balance between power and price. Exactly as the name implies, this is truly a complete broadcasting solution. 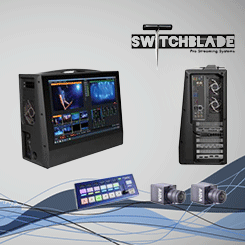 More than just a powerful suitcase-sized switcher, the Switchblade Turbo Complete also gives you (2) 4K cameras, a portable IP control surface, a full graphics suite, and more. This solution gives you more than you bargained for… in a good way. See how Stream Dudes gets the most out of these systems by looking at our Dude Packs and other broadcast packages/solutions designed for Houses of Worship, Education, or Government Broadcasting. For more information, simply Contact Stream Dudes to learn more or to place an order.